This week Philips joined the many companies trotting out their fall HDTV fashions for the press in New York. Philips had several promising products to show (more on that in subsequent stories), but one notable absense was the company's plasma TV line. According to Philips, the company will continue to sell plasma sets, but the emphasis is clearly now on LCD panels, confirming my drum beat that LCDs are poised to replace standard CRT televisions in most homes. Notable also is the fact that Philips will offer improved sets with 1080p resolution and 120 Hz refresh rates (for better display of high-speed motion, like hockey games and motor sports) in sets above 42 inches. Philips stands out among competitors with its ambient light feature, which uses lights around the frame to enhance the dominant colors of video scenes and create the illusion of being more immersed in the program you're watching. However, the company will also offers sets, like its 42-inch models without the ambient light feature for what should be prices of around $1,200 in stores this fall. For more on how to choose an HDTV, see "The HDTV Battle" and for information on Sony's forthcoming sets go to the "Sony, Sony, Sony Days" story below the fold under the Entertainment banner on the front page of J-Q.com. 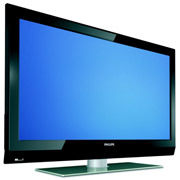 This entry was posted in Uncategorized and tagged hdtv, lcd, philips, plasma, quain. Bookmark the permalink.